Our bags come with block bottom shape that can minimize space for storage and during transportation process, combined with valve for easy filling, especially for cement industry that is commonly using rotary packer to maximize their filling capacity. It is also stronger and more durable than multi-ply kraft paper or PP woven sandwiched kraft paper cement bag. 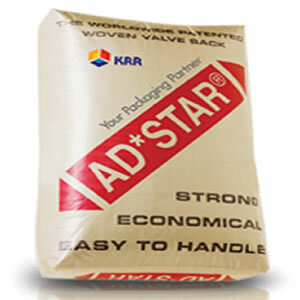 Cement bag is generally made from multi-ply / multi layer kraft paper (up to 5 ply) or PP woven sandwiched kraft paper (up to 3 ply). But nowadays with our latest European Technology, we can eliminate the usage of kraft paper and replace it with only 1 ply high tenacity laminated woven PP fabric that is fully recyclable so it means the bag is more eco friendly. They also have micro perforations technology to assure that they have highest standard on air permeability. This fully adjustable conversion system giving the ability for the bag to be airtight to highly air-permeable for filling or breathing the goods and yet ensure perfect protection for the products. This block bottom bag can be used for cement, resin, and other bulk material.